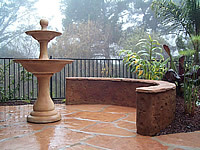 Patios will often have adjacent elements such as fireplaces, cooking areas, water features, and statuary. 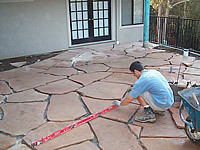 Paving is the most practical outside element. It reflects the use of the home. 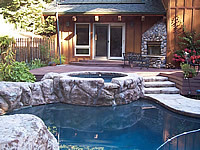 Consider traffic flow, entertainment areas, sitting areas, meditation spots, and entryways. Heating can be built in. Sometimes walls are place just because they look good and add volume to an area. Glass tiles or seashell impressions can be added for interest. They can serve the function of acting as built in seating. Retaining walls that serve to hold up a hillside are generally to provide more space. Selection of materials is important if it’s being viewed often. 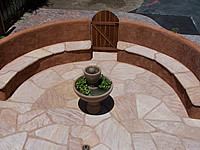 Finish and color can be done in natural stone, or textured and colored cement.